← It’s Christmas, Do You Have an Arizona-Grown Poinsettia on Your Shopping List? It’s officially holiday season and that means sweet treats are plentiful – from office parties to family gatherings. While we may likely consume a few sweets over the next few weeks, remember that too much sugar can trigger inflammation. So, let’s dig into a few ways we might still be able to enjoy the jolly season without taxing our health too drastically. According to the American Heart Association, the average American adult consumes 22 teaspoons of “added” sugar per day – far exceeding the guideline of 6 teaspoons per day for women and 9 for men. Added sugars translate to anything that’s been added to processed foods, it does not include sugars found naturally in fruits and vegetables. Say NO to nog – if it’s fully loaded, the average cup of Eggnog contains 19 grams of fat per cup and is 343 calories. Hot chocolate makes a great alternative. It actually has fewer calories and contains antioxidants. Eat a healthy snack before the party. 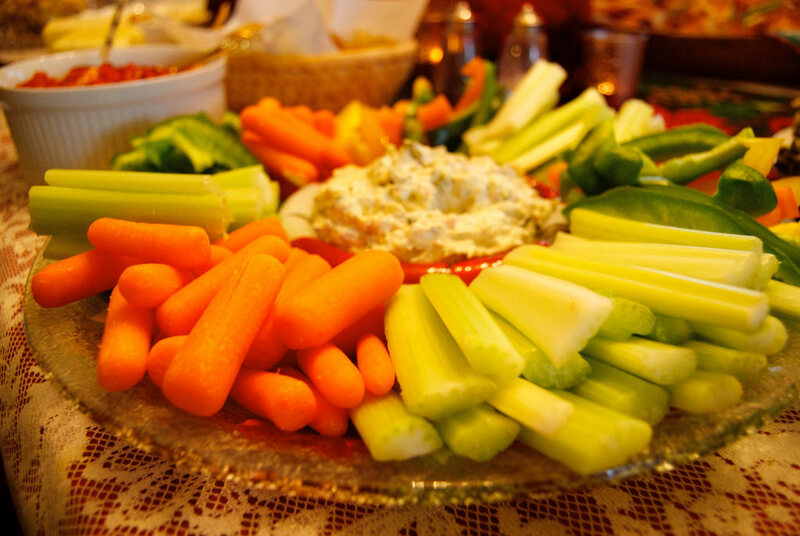 Then when at the party, choose healthier options such as raw vegetables, shrimp cocktail or mozzarella and tomato skewers. Turn down the tunes – that’s right, the softer and slower the music, the less you’ll feel inclined to eat. Scoop up hummus or salsa for dips. Back away and survey the spread – standing closer to the snacks compels us to eat more, plus choosing 2-3 healthy choices to fill up on is much better than picking one of everything at a buffet. Make your own cranberry relish – Simmer 2 cups of fresh cranberries with ½ cup each of honey and water or orange juice until thick. Cover and chill for 30-60 minutes. You’ll skip 21 grams of sugar with this tasty recipe. Last, but certainly not least, go to your gatherings with a focus on people. Think about all the people you want to connect with, meet and learn from. Make that a gift to yourself. It’s the people in our lives who ultimately offer the best sweetener for a good life. Editor’s note: This article originally appeared in Dr. Levitt’s Healthy Living Newsletter in the December 2017 issue. We reprint here with permission from Dr. Levitt. This entry was posted in Cooking, Desert, Diet Tips, Fill Your Plate, Food, Grocery, Health Tips, Healthy Eating, Holidays, Produce, Vegetables and tagged Fruit, Health, Heart, Holidays, Party, vegetables. Bookmark the permalink.